Light + Love : Red. Just a house decorating project update. Been re-arranging little things here and there. I'm 90% done. The splash of red is making me happy. And oh, changed my curtains to deep red. The entire process of this decorating project has been very therapeutic and a great learning experience for me. My shoebox of a house may not be the prettiest there is, but this is home to me. Printed black and white photos of my family, except for Mom's picture. She's the pop of red in this area. I also opted for simple frames. They look clean against my stenciled wall. Transfered my black lamp on the left side and added a red clock. The vase and flowers are now on the right. The red wooden doll is now sitting beside my DVD player. It's the pop of red on my TV rack. 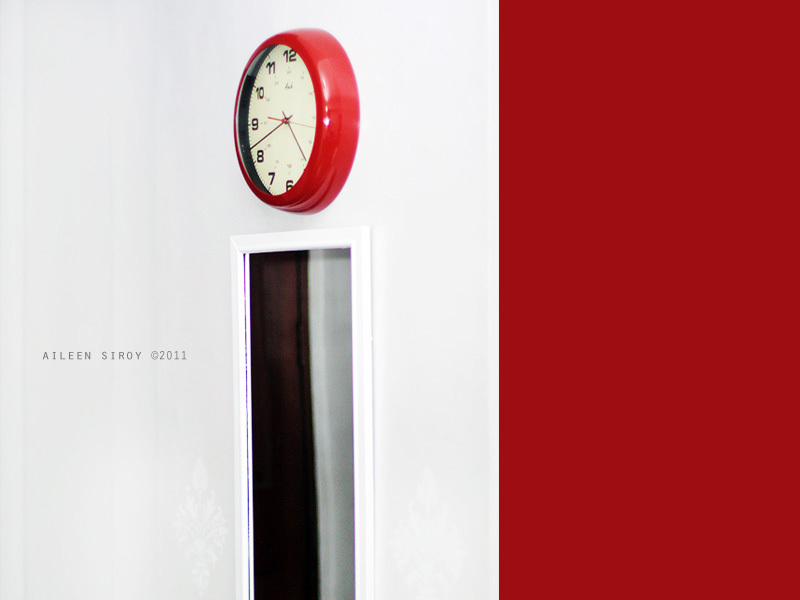 This red metal retro-ish clock is the pop of red in my three-step foyer. Haha. 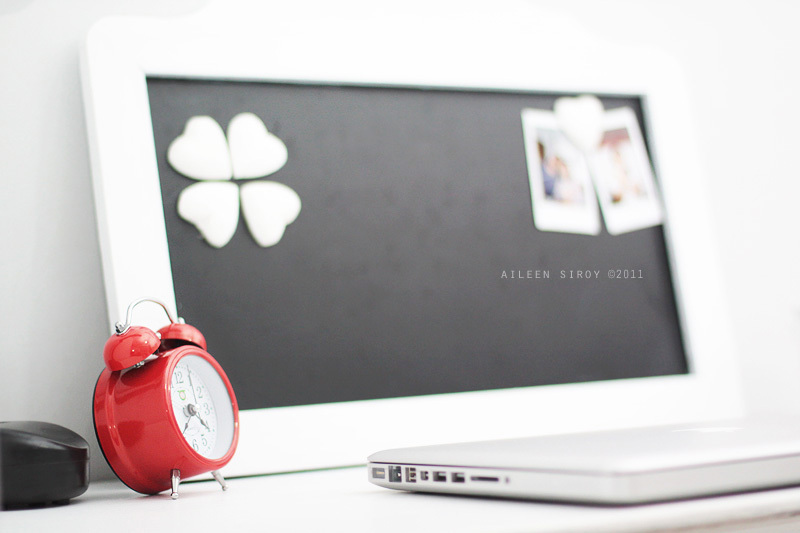 Oh, I love this clock! Further to the left beside the door is my built-in shoe cabinet which used to be brown. Painted it white, too! This is my sleeping area. Found this affordable pillow at SM! Perfect for an accent piece for my all-white bed. And see those red curtains? I'm just loving it! 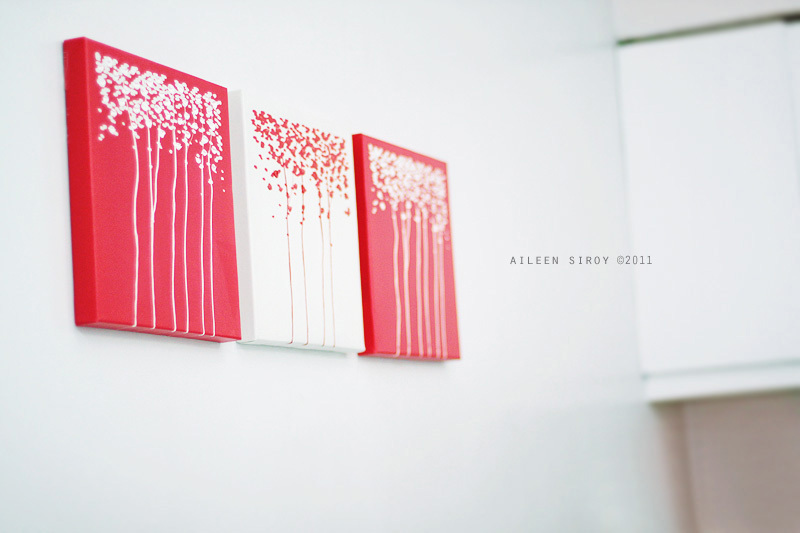 That picture on the right is the wall I also stenciled -- white on white. 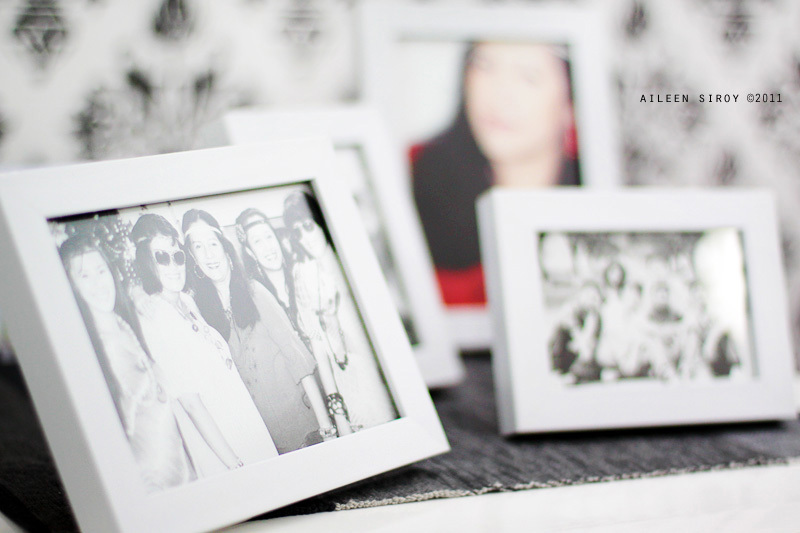 :) I hung a black and white photo on red wooden frames for some pop of red. looking so good! one word: invite. ps. can you also, therefore, throw those warhol prints my way? Your home is looking good Ai ... modern chic (reminds me so much of ikea home designs... i love ikea)!!! Ate ai, I super love your home makeover, as in very calming ang effect. hurot na jd ahong bilib nimo ate. You are a superwoman personified! super duper love what you did!!! ai, your space looks amazing! and that pillow? wow! i tell ya, you have more talent per ounce than anyone else i know!